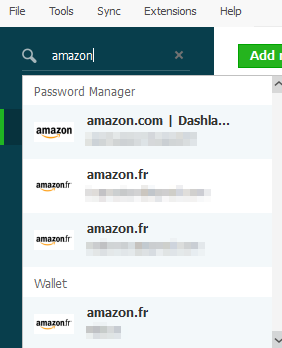 The search bar in the Dashlane application is a great way to get around the application quickly. Just start typing and we will immediately pull up suggestions that will help you find what you are looking for, be it a credential, a purchase, and ID, a contact or just about everything save in Dashlane. You can even go directly to a website associated with a credential by clicking on the icon, or quickly access other features. You can use the search quickly by pressing Ctrl + F on Windows or ⌘ + F on Mac OS X.